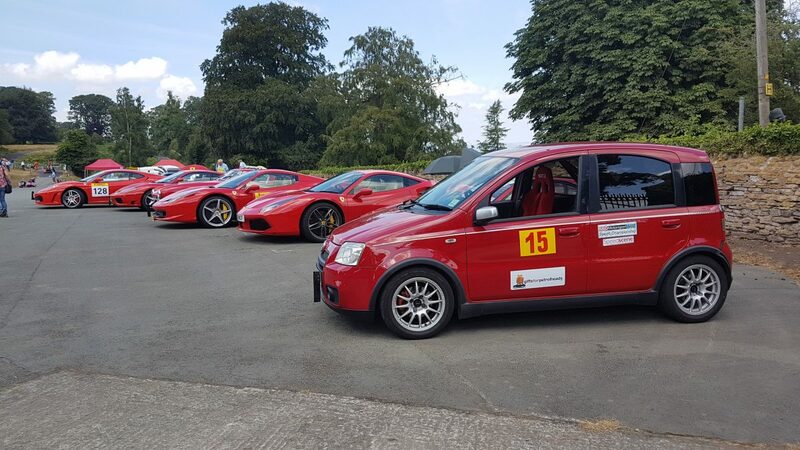 This Saturday and Sunday I was at Loton Park hilllimb. Last year I did a full season at Loton but this year, because of various holidays, I’ve missed all the previous rounds and this was my first visit. It may also turn out to be my one and only visit in 2018 since I have other commitments for the next two meetings. Anyway, the target time I had set myself was 72.14 seconds. On Saturday this time eluded me, though I was getting frustratingly close. Front wheel drive is so different to rear wheel drive and I was getting lots of understeer and tyre squealing. I returned on Sunday and sought some advice from Tim Cross and Hugh Elliot, both in the roadgoing up to 2 litre class and both racing instructors. They both said the same thing – brake later and be patient before feeding in the power gradually. Mission accomplished. So another very satisfying weekend! The weather was perfect, hot and sunny, and everyone at Loton is really friendly so it was good to be back. I just wish I could go more often. I’ve always liked R8 Gordinis. And Alpines! Wow, so petite and curvy. My panning abilities seem to have deserted me. Most of my shots were unusable, maybe because I was arguing with Gail Knight at the same time as to whether Kimi had run into Lewis on purpose and whether Lewis is a cry baby. All the while Rob Macdonald just continued to take his great photos. These three were the best of mine, though none is really in focus. Must try harder. Mark Dalton in his Empire Evo raising the front left at Fallow. Mark set a PB of 50.57 on Saturday but couldn’t quite beat it on Sunday. The angle of this shot makes it look like he has the biggest timing strut ever! Cars in a deer park on a sunny day. Perfect. I couldn’t resist parking alongside the Ferraris to get this very special shot of the Fiat Panda 100HP. My best Sunday time – 71.47. The slowest Ferrari’s best time on the Sunday – 70.32. Getting close! I won my class on both days but can’t brag really as there was only my Fiat and Colin and Daniel Mee’s Austin Healey in Class 1A and the Sprite is no match for my more modern and more powerful Panda 100HP. This is Colin just about getting around Fallow. (Picture credit goes to John Hallett, one of Loton’s official photographs, who kindly gave permission to use it. You can see more of John’s photos on John Hallet Photography). Colin too had a good weekend with a PB of 74.08 on the Saturday though due to various mishaps (such as the one above) he was not able to beat that on the Sunday, though son, Daniel, did set a PB then of 74.98. These blog posts never purport to be race reports and I have no real idea of how other people fared in their classes or what troubles they overcame or what personal triumphs they achieved. However, here are some of the things I was aware of. I was always first up the hill in my class so had a great view of everyone else coming up. Brian Marshal made a spectacular entrance into Fallow (corner) with his right wheels slightly on the grass. Under heavy braking this put him really out of shape and his big Porsche just did not slow down. Somehow he missed the tree ahead of him and although his Porsche walloped the grassy bank, it did not embed itself in it nor take off but bounced over it and Brian turned it around and drove back onto the track, around Museum and over the finish line in 112.66 seconds (against his PB of 63.34 set on his previous run). Very spectacular! I said I was first up the hill, but that’s not quite true. The double drives (I think there were three of them), went ahead of the main first batch so their drivers could return and hand over their cars to the second drivers. In this group were Colin Gascoign (MG ZR160) and Jane Hibbert (BMW 328i SC). They were not in the same class but they’re in the same story. Jane had had her first run red flagged because of a pheasant on the track and had had to return to the bottom and have another go. Meanwhile Colin had reached the top and had thought the marshal in the holding area had waved him down the hill, so proceeded very slowly to make his way down. As soon as he crossed the line at the end of the holding area another marshal, knowing that Jane was still to run, blew his whistle and waved a red flag. Colin immediately stops but this signal gets repeated from marshal post to marshal post down the hill until Jane sees it and stops again. This means she has to take a third run and ends up joining my batch. At the top I ask her why she’s with us and she tells me the story – the pheasant and then about a car that had started rolling down the hill. I of course repeat it Chinese whispers style and we have an empty car rolling down the hill with nobody able to explain how it was ever stopped and nobody knowing whose car it was. Later of course all is explained, but over bacon sarnies Rachel Gascoigne suggested her Dad should have the story tattooed on his forehead as he had explained what had happened so many times she can’t bear hearing it any more. This is Rachael at the wheel. It’s not often you get such a clear photo of the driver at speed. This photograph is one of Ian Dowding’s. You can see more of Ian’s photos on Track Action Photography. Talking of red flags and wildlife, again while I was at the top of the hill, the runs were red flagged. This time for an inquisitive deer who was wandering about near the finish line. The following photo shows the marshals busy trying to shoo it away. Most people sit around between their runs describing their last drive, always their best performance ever, ruined only by a missed gear change or some mysterious mechanical gremlin, but one driver was seen changing out of her racing suit and into a dress mid morning. Mary Elliot set a PB of 66.49 in practice and then drove off to her art gallery in Ludlow ( Twenty-Twenty Gallery) for a private viewing and was back after lunch to compete. I was very impressed. Hundredths of seconds are all important in Speed Hillclimbing but sometimes even that minuscule division of time is not enough to separate competitors. In the roadgoing, up to two litre class on Sunday, David Williams (MGF ) and Tim Cross (Renault Clio 197RS) both had a best time of 65.78. This was good enough for third and fourth in class and was decided by their next best times allowing Tim to claim the third spot. Good job Rob Wilson’s ‘other’ score was not counted as he had a FAIL on his first run. He did do a 61.87 on his second run though, which was good enough for the class win. I’ve had to withdraw from the next meeting and can’t attend the late August one, so my only other chance to compete at Loton this year is on 22/23 September. I just hope I can make it. I have to agree, Ray. Great blog post Bob & thanks for the link.